The 1611 appearance of a new English translation of the Bible, known variously as the Authorized Version or the King James Version, is a landmark of cultural and religious history. In celebration of the 400th anniversary of this event, Rare Books and Special Collections (RBSC), in collaboration with the Vancouver School of Theology, Regent College and University Hill United Church, presents an exhibition that explains the origins and significance of this book. You are invited to visit the presentation and learn about this remarkable story of scholarship and sophistication that has broadened our social and religious understanding. A catalogue of the exhibition is also available. 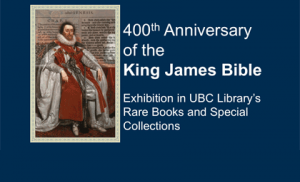 The 400th Anniversary of the King James Bible 1611-2011 runs through October 2011 at RBSC, located on level one (the lower level) of the Irving K. Barber Learning Centre. An exhibit produced by two UBC graduate students is now on display in the Irving K. Barber Learning Centre. The Pose Stands for Potentiality – featuring works by Jordy Hamilton and curated by Toby Lawrence – juxtaposes UBC’s presidential portraits with a series of smaller works, fostering a conversation between contemporary and traditional forms of painting. Jordy Hamilton and Toby Lawrence are pursuing an MFA and MA, respectively, in UBC’s Department of Art History, Visual Art and Theory. The Pose for Potentiality, which runs until October 14, 2011, is located on both levels of the Ridington Room, located on the third and fourth floors at the north end of the Learning Centre. 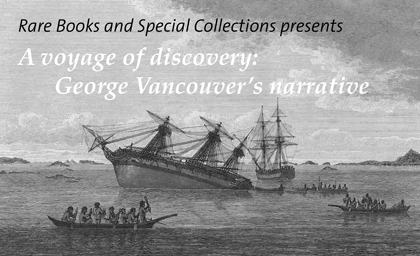 In honour of the City of Vancouver’s 125th birthday, an exhibition highlighting the voyages of George Vancouver is on display at UBC Library’s Rare Books and Special Collections on level one of the Irving K. Barber Learning Centre. For more information, visit events.ubc.ca or the Rare Books and Special Collections blog.